Hello! So glad you stopped in today. I am a stop on today's hop for the January Release over at Pinkfresh Studio. 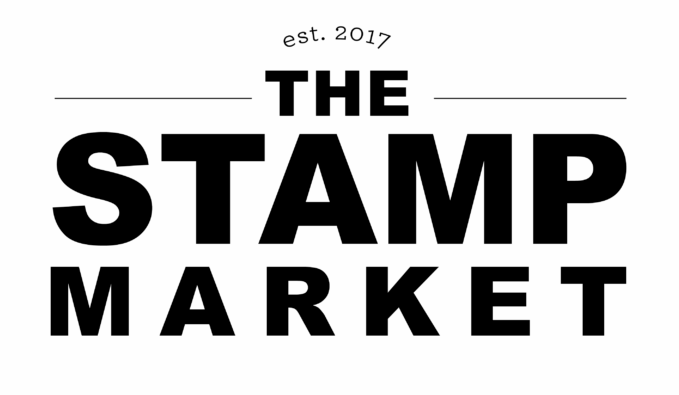 There are so many gorgeous new products and I have a few cards to share using some new stamps and dies. Keep scrolling to learn about the amazing giveaways and also to see the full list of stops on today's hop. 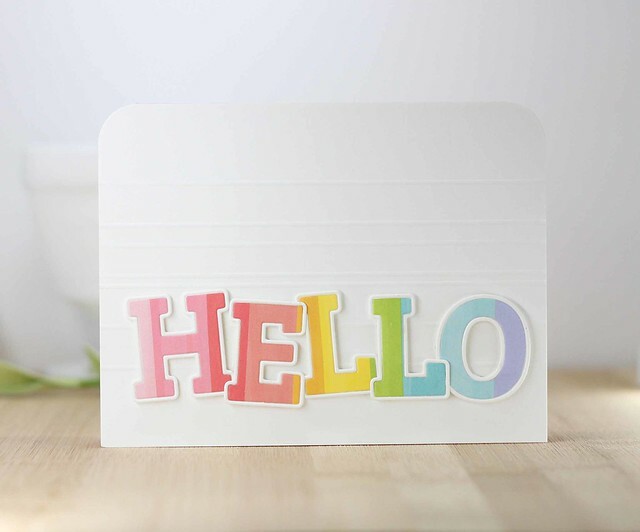 To create this card, I die the word Hello in rainbow patterned paper and then again in white card stock. I scored a few lines on the card base for a little extra detail. Using the rainbow inside, I attached the white outline and attached them together. I popped up the letters on fun foam and adhered them to the card front. Last I rounded the top 2 corners for a little extra detail. Another new stamp set is called Lost in the City. I love the visual of this stamp set. 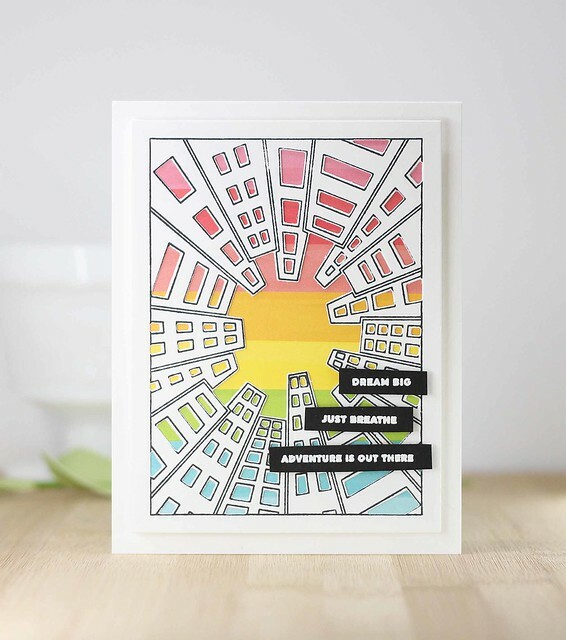 The buildings create a fun look for your card. First, I die cut the Lost in the City die and then using my Misti, I stamped the building outline. It was easy to line up and stamped out really well. Using the same rainbow pattered paper as my first card, I lined the back of the die with the paper. I picked out 3 sentiments and heat embossed them on black card stock. I added those to the front of the card with foam tape. I love the clean and simple look of this new stamp set and coordinating die. Makes for a fun card for sure! To create this card, I did a little ink blending along the bottom of the card base and then added in the outline piece of the Gatsby Die set. 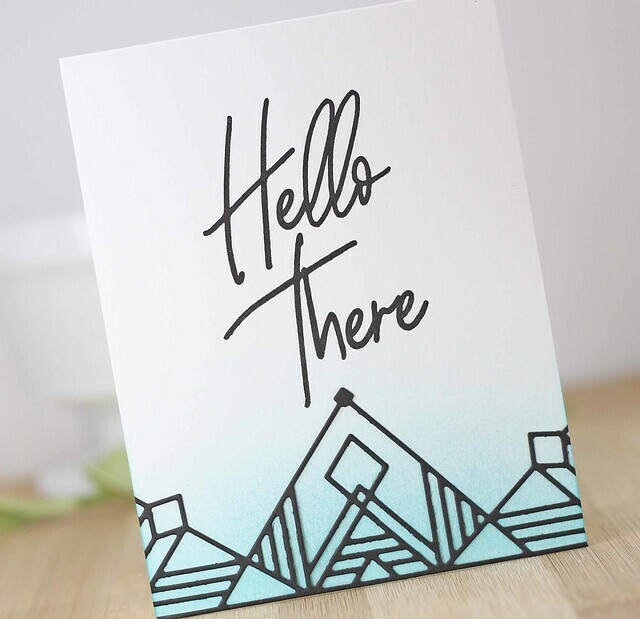 Last, I stamped the Hello There sentiment from the Scripted Bold Sentiments 2 set. 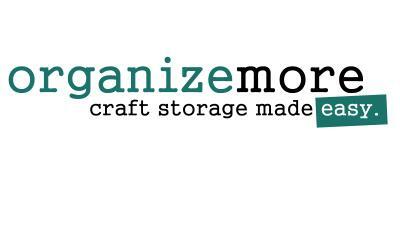 This sentiment set is the perfect addition to your craft stash. The handwritten sentiments are so fun and very easy to add to any card! That is it for me today. 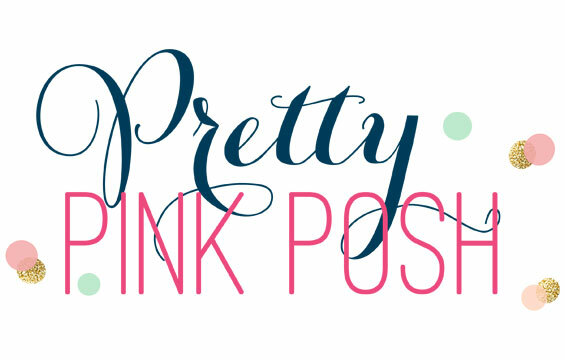 Keep scrolling to learn about the prizes and check out all the stops on the blog hop. Pinkfresh has several amazing giveaways today. 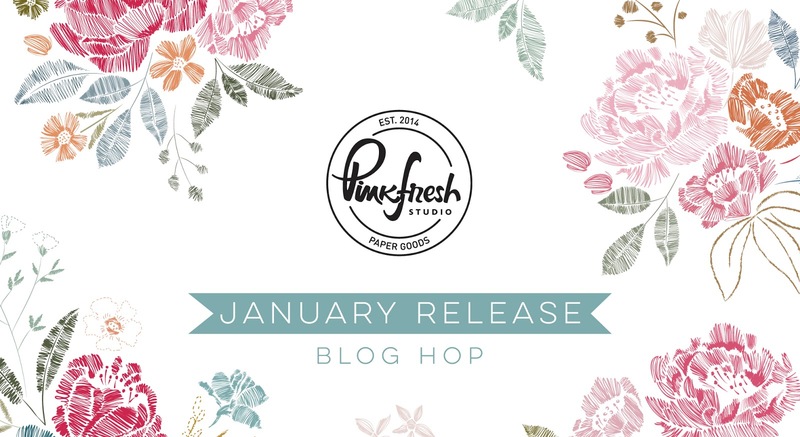 Check out their blog and IG feed to learn the details on how to win the full January Release. By leaving a comment here on my blog, you have the chance to win a $25 gift card. All winners will be posted on the Pinkfresh Giveaway Page. Please check the giveaway page on Sunday, January 20th. If you are a winner, you will have 2 week to claim your prize. Thanks so much for coming by today. Hope you have enjoyed my stop! Have a great day! 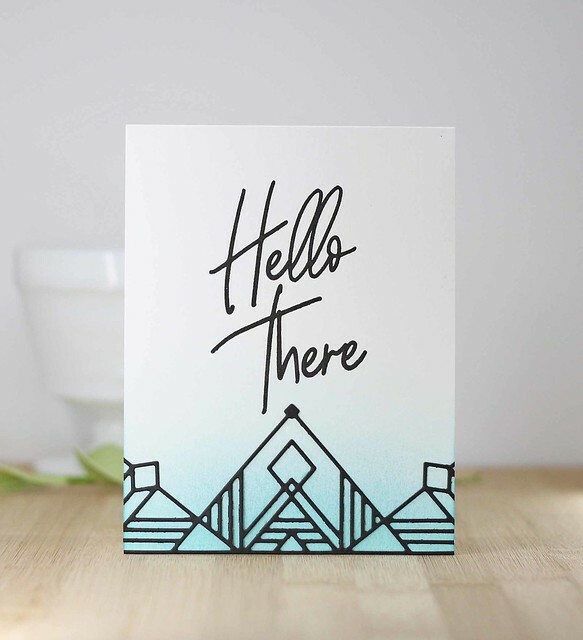 I love the HELLO card and the way you used patterned paper for that and the city card. I need to get my patterned paper out and make something. TFS! Awesome cards! 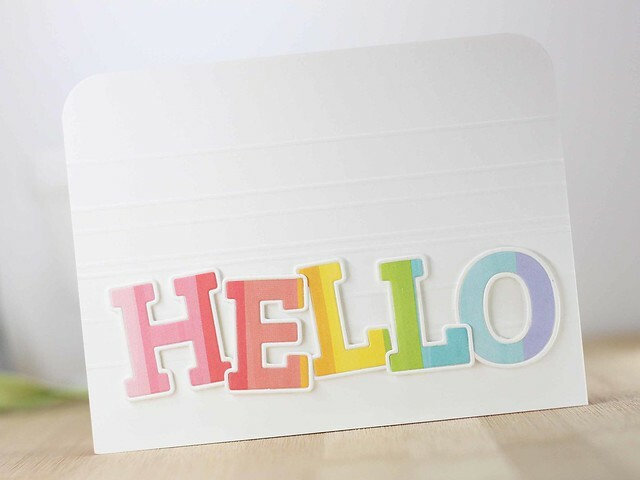 I love the simplicity of the rainbow hello card. Gorgeous, crisp, and I think I could do them! I love how your background adds to the dizzying heights of Lost in the City! And that Gatsby card is SO elegant!! Love how you used the patterned paper with the dies! Love your CAS cards, Laurie! I love all your cards, but the Big City one would be so perfect for something like graduation or a job promotion. Love each and every one of these cards! My wish list gets longer and longer! Oh my gosh Laurie. These are all so beautiful. I LOVE the city die and your card using it. So fun!! I'm such a sucker for rainbows. These are phenomenal! The bold dies are incredible, your cards are incredible. I need these incredible goodies!!! OMG these are stunning, Laurie! Love the rainbows and that beautiful Art Deco card, WOW! Laurie, thank you for sharing your cards with us! They are so bright and fun. The sentiment stamps in this release are truly gorgeous. I love the way you used them! Just beautiful! Great cards! Using the rainbow background paper was genius. Love your ideas. Love your Hello card, the colors are so cheerful. I LOVE the rainbow HELLO! Great CAS CARD! Beautiful cards. I love those "rainbow" letters. Fabulous cards, Laurie!!! I love your rainbow HELLO card---so perfectly CAS and super sweet! And I am loving that Lost In The City set---so unique and fun! on the last is bold. These are awesome, Laurie! Love them! Great use of subtle color in all these cards. Looks like a great release from Pinkfresh! Love your work! You make clean & simple look stunning! Wow, gorgeous cards, I love the rainbow colored Hello and the Lost in the City cards are amazing! Nice ombre effect in your cards! Those letter dies and how they are an outline and a solid! Amazing! And I love the big script and style of the sentiments. Such simple and elegant cards. Fabulous cards! The Lost in the City card is amazing.... love that set! Love your cards! I love clean and simple cards. Happy, fun and graphic - love your colors and clean designs! The first Hello card is my favorite. I love your bright and beautiful splashes of color! our cards are awesome! Super fun cards. Love the new alpha set, your rainbow hello is so pretty. Love you hello card! That’s so cute. You have done an amazing job showcasing the new products!!!! Love your cards! Lost in the City is one of my favourites in this release. I also love your first card. It is so clean and simple and stylish! Mmmm, love all the rainbow colors and effects!!! Great job on these CAS cards!! Yep. Even better here than on IG! That alpha die with the outlines is so cool and so original! Love everything in this release. Seriously. Everything. Such wonderful cards! love them all! Ahhhh...... rainbow happiness at it's best! Love the Gatsby card too!! Your cards were well thought out I can tell. You do wonderful work. The cards are awesome. Thank you so much for sharing!! Love your clean, graphic card designs! Laurie I love these cards especially the fun Hello one. So fun and pretty. Great job. I love your rainbow cards and the simplicity of the last card. So fun! Beautiful card designs! The rainbow city is lovely! Such happy colourful cards,I love rainbow cards! But the third one is lovely, too! This release is wonderful. Love your cards and the colour you used. Your simple fresh style in these cards is great and easy to make a pack for a friend, Thank you for your samples. Your cards look great. I just love the Gatsby die. Your city reminds me of something out of a comic book. I love it! love your cas and rainbow style! You are so clever, Laurie! I love how you played with all of your new goodies...your cards are fabulous! I love how coloring are your cards! there are perfects! I love your rainbow cards! 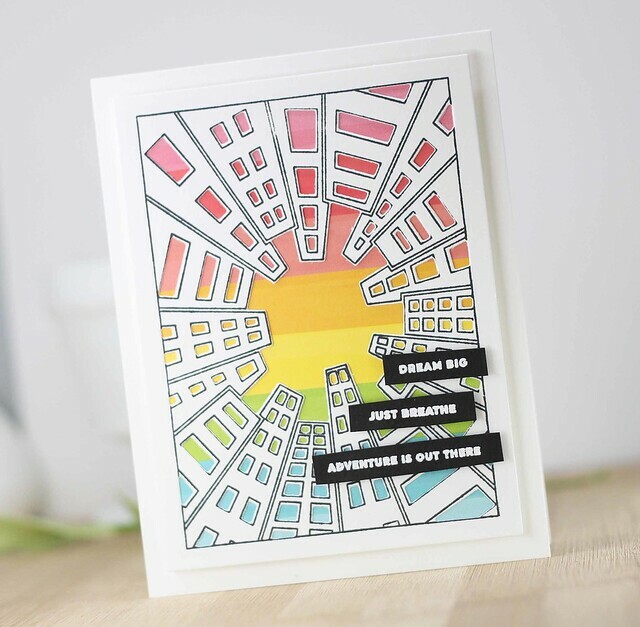 Those alpha dies are fantastic and I am totally smitten with the lost in the city products! Also LOVE how you used the Art Deco dies! I really like the simplicity of the second card. It really shows of the stamp! Awesome creations, Laurie! I overlooked that wonderful alphabet set till seeing your pretty creation. It's on my wish list for sure now!! Thank you for the inspiration to use pattern papers for die cutting alphabets ! They look so fancy ! Your first card is fabulous! The second is awesome! And the third is terrific! Lovely cards, my fave is the third geometric design. Thanks for sharing this inspiration with these fun products. lovely set of clean and simple cards! So colorful! I love how bright these are!